There has been a bit of a hold up with the artwork on the jackets. ..Thats the bad news! But it does mean that for those of you have been slow off the mark still have a chance. The design came out pretty good and we are even considering doing shirts as well. Its been a bit of a slow start to the year, it seems if I have not been diving I have been working very little gets done in between. I have had a bunch of guys all going ..."How much are subs this year"
Well after careful consideration and much calculating the inflation rat taking into consideration the fuel price, Zuma's new wife, the cost of wine gums and the lack of electricity. I have no option but to adjust the membership subs for 2008. Now hold onto your socks........ the subs have more than doubled!!! You can get your club fees for free! Buy one of the new Salty Divers weather jackets (made by Senqu and embroidered with the Salty Divers logo) For R420 ........ This is well below normal retail price!!!!! And you can get your club fees for free! Salty Divers Weather Jacket ...will last for years!!! Get to answer people who ask you about your shaweeet jacket!!!! ...this is the big one!! 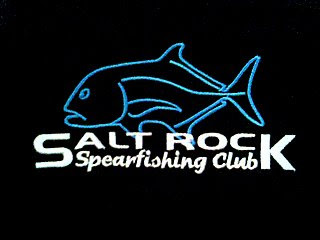 Now there are probably some of you that are going "Gee I dont have that kinda loot"
Dont fret my friend ..... You can go for the usual R200 and get a Salt Divers T-shirt ..... last years model. Please mark the Beneficiary Reference on the On-line form or Deposit Slip with your Name and Surname. Then Fax or e-mail confirmation of your deposit to Carol our Club Treasurer. Details to include when confirming payment. And then our next Club Meet will be on the Friday 7th March. We should have plenty bugs by then so maybe we can have a Bugg cooking comp?? ?